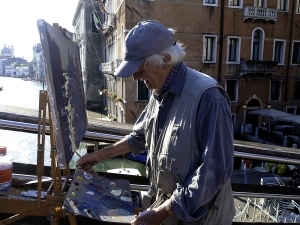 Ken Howard is one of the most gifted and accomplished figurative artists of today. He is particularly successful in expressing the effects of light and dark in both oil and watercolour paintings. His favourite and most famous subjects are studio pictures, Venice, Cornwall coastal scenes and London. Ken studied at Hornsey School of Fine Art from 1949-1953 and at the Royal College of Art, London 1955 – 1958. He was elected a Royal Academician in 1991 and awarded an OBE in 2010. His published works include Inspired by Light: A personal View (2001) and A Vision of Venice in watercolour (2002), Light and Dark – The Autobiography of Ken Howard (2011), Ken Howard’s Switzerland in the footsteps of Turner. ‘For me painting is about three things. It is about revelation, communication and celebration. By revelation I mean giving people a way of seeing, revealing the world around them in a way they have never seen before. By communication I mean revealing the world with a personal language, speaking directly in an instantly recognisable style. For me drawing is the basis of all visual language, for the art of drawing is a way of seeing and celebrating the world. Ken works relentlessly, lives life to the full and continues to be inspired and cleansed by travel. He now paints predominantly in oils. 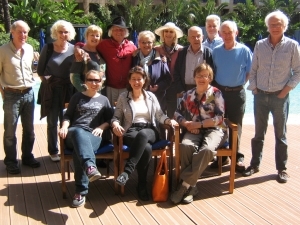 Ken has been hosting painting holidays for Spencer Scott Travel since the early 1990’s, and his energy and dedication help to make them hugely rewarding and successful.Destinations have included India, Cuba, Morocco, France, Greece, The Yemen, Venice, Bruges and Amsterdam. Ken is an extraordinary host – he is a warm and generous person, an excellent communicator and amusing raconteur. We feel privileged and honored to be working exclusively with Ken Howard. 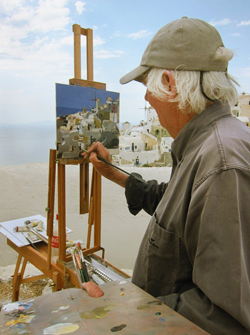 ""I want to let you know that the workshop with Ken Howard in Santorini was simply the best workshop I have ever attended. I was deeply inspired and impressed by Ken. The group was a pleasure. I hope this workshop will be repeated again." "
""Ken was so kind, helpful and enormously interesting to be with. I know I have gained a great deal from the experience of some of his incredible wisdom and insight and having the privilege of working alongside such a great artist""